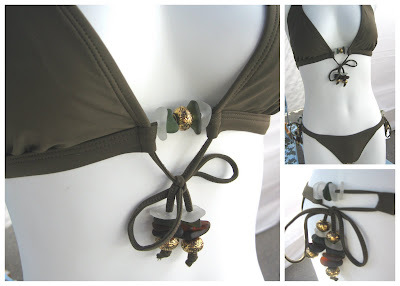 Boston Handmade: New Work ~ Sea Glass Swimsuits from Sea Glass Things! New Work ~ Sea Glass Swimsuits from Sea Glass Things! This year I decided to add yet one more thing to my ever expanding list of items I offer... Sea Glass Swimsuits! My first swimsuit made it's debut at the South End Open Market's Opening Weekend. I hope to be creating more of these as we head into summer! They got a lot of "oohs and aahs" so we shall see how they do when I get it up in my shop! Check my Etsy store for new listings! What a wonderful idea! Keep the creativity flowing.